Kabaragala is the highest peak of the Dolosbage range which has a height around 1500m. It has an almost flat terrain at the top similar to Horton Plains and there’s a huge drop similar to the World’s End as well. 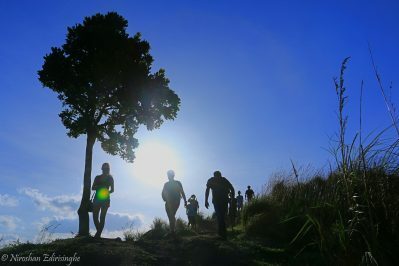 Ambokka is not a known hiking destination but its one of the most prominent wet forest mountains boardering Kurunegala and Mathale districts. This year I have been hunting Mini world end’s around the country and on my quest I came across Kelebokka view point too. We left early to reach Panvila where we were accompanied by Nishan (who resides at Panvila) to our first destination which was Hathale MWE. Watawala had the record for maximum annual rainfall in Sri Lanka few years ago and this area is well known for tea. This is all about lesser known Watawala mountain range. It was 9 Years back when I first came to know about this magical location but somehow I couldn’t pull it off due to various reasons. Not like 9 years back now I was fully equipped with lot of information which aided me to pull this off! I think I dont need to explain the route details since its documented well in previous reports and almost every one is aware about the trail. Rahala Kanda (900m) – රහල කන්ද and man-made ponds! Asupini Ella is margined by Rahala kanda/ Rahalagala in one side. there are some man made ponds on top of Rahala gala and good surrounding view. Ambalakanda (920m) is a mountain situated at Aranayaka area with an easy access. Galhenagala is situated closer to famous Asupini falls . This our journey to Ambalakanda followed by accidental visit to Galhenagala. Great Western Mountain (2212m) is the 7th highest mountain in Sri Lanka situated closer to Great Western estate and station. I have been there 9years ago and now the hike is not a difficult task with well paved pathways. We have added task to get down to Pundalu Oya side to explore hidden waterfalls. Makulussa (916m) is a mountain range situated at Matale-Kurunegala border, surrounded by famous taller peaks of Matale- Wilshire, Etipola and Ambokka. Kotagala mountain (1754m) is well seen behind Hatton town as a giant. It is known as a Singimale mountain due to close proximity of longest railway tunnel of Sri Lanka-Singimale. Hike to Kotagala Mountain is a hard trek because of Mana bushes.